We are blessed to have such a unique and wonderful church here along the picturesque Northwest Arm. 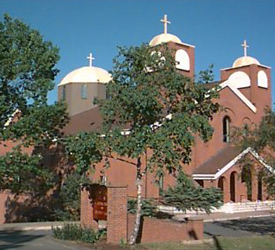 Truly, there is no other church like St. George’s Greek Orthodox in Atlantic Canada! We welcome you in for your chance to see the beautiful space in full detail with a guided tour from Father Peter Maropoulos. Join us as we explore the Byzantine theology and how it is reflected in the architecture and icons of the church. Travel through the space and explore the 3 distinctive parts and symbology of the narthex, nave, and altar. See the intricate carvings and details on the templon, as well as the important iconography housed on the beautiful divider between the altar and the Church. Delve into the colors, imagery and importance of the icons housed throughout the church that represent events in the life of Christ. Tours run approximately 45 minutes, and guests can feel free to participate in a Q&A with Father Peter for more insights into the theology and the church. There will be 1 tour on Thursday, 2 on Friday and Saturday, and 1 on Sunday. Check the schedule for exact times. See you there! Don’t forget to stop into our market where you can take a piece of Greece home with you. Whether it’s Greek coffee you need in the morning, a Fisherman’s cap for your day at work, or books on Greece for a bed time story, our ‘Monastiraki’ is filled with unique Hellenic gifts. If you don’t get a chance to visit the Acropolis Museum this year do not fret! The Exhibit Room in the Main Hall has a tremendous amount of informative displays and artifacts giving an in depth view of Hellenic Culture as well as the history of our Community. Displays, photos, multi-media and more have been gathered up from members of the community to showcase who we are and why we are proud! 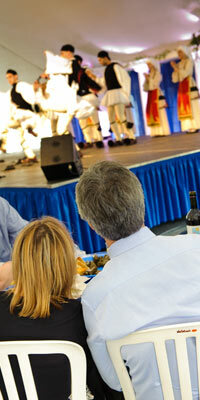 Come and immerse yourselves in our rich culture, and be Greek for a day! In case you haven’t picked up the language fluently from your last trip to Greekfest we have included this little starter for you. Kefi – The Feeling that comes over one and can only be expressed by dancing, singing, and radiating with happiness! How Are You – Ti Kanis? Still need to brush up your skills? Join us for one of our language classes. Check out our full schedule of events for time & location.